No, not because both brothers were drafted in the first round of the NFL draft... Vontae will tell you that Peyton and Eli Manning also hold that honor. But Vernon and Vontae are now the first pair of brothers to have verified athlete blogs on Yardbarker! Head over to Vontae's new blog and welcome him to the blogosphere. 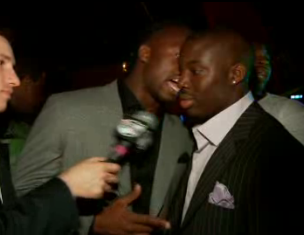 Pictured here is Vernon convincing Vontae that he needs to blog on Yardbarker (you can see the video on Vernon's blog). Thanks for doing my job for me Vernon! And then there's Troy Polamalu, who just may give Mark a run for his money in the "dreamy NFL players with hair" category. I think we all know that anytime you touch LeBron James, you’re going to be sent to the showers! You accidentally bump into him and you’re going to be “rub-a-dub-dubbing” in the locker room bathtub! Read his full post on Yardbarker and keep checking his blog for more. New and improved NBA Playoff spots -- now with CGI technology! There's also a spot featuring Larry Bird. True story. It was not a compromising situation for him. Phil Jackson is a good dude.